While the recently passed Tax Cut and Jobs Act (TCJA) eliminates the marriage penalty for many couples, some couples will see still this penalty. What is a marriage penalty? 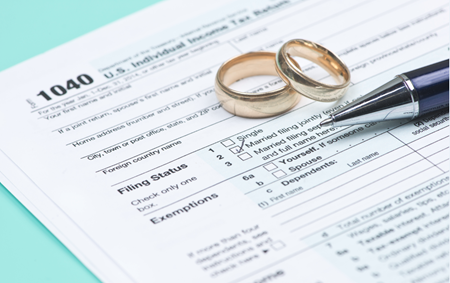 Couples incur a marriage tax penalty when their combined income results in a larger tax bill than if each had filed as a single taxpayer and totaled their individual income taxes. What is a marriage bonus? A tax bonus can happen when two individuals with unequal incomes marry. If a high-income individual marries a low-income individual, the couple can get a smaller tax on their combined income compared to the total tax they would pay if each filled as a single taxpayer. The TCJA did not specifically address the marriage penalty. The act did not reform taxes it just cut some individual and corporate taxes. The tax cuts for individuals occur due to the new regulation’s changes to the tax brackets and standard deductions. The Washington DC-based Tax Foundation crunched numbers and discovered that only high-income and very low-income married couples will incur a marriage penalty. At this link, you can read the Tax Foundations complete analysis of the marriage penalties and bonuses under the TCJA. High-income couples earning jointly more than $400,000, get a marriage penalty due to the new law’s tax bracket changes. In the past, even moderate-income tax filers received a marriage penalty. Now the tax law has effectively eliminated the marriage penalty except for those with higher income. Married low-income couples can see a marriage penalty due to the Earned Income Tax Credit (EITC). When low-income individuals marry and they combine their income, they may discover that their combined income pushes them into the phase-out range. The phase-out means the couple no longer gets the full EITC deduction. Under the TCJA, the EITC phase-out range starts at an income of $21,000 for couples and $15,000 for singles. You can read more about the EITC at this link. The number of children in the household will also affect the low-income couples’ tax bill under TCJA. According to the Tax Foundation, a very low-income couple with one child can incur a marriage penalty of $600. This happens for two reasons. First, after marriage, the couple reduces the “head of household” exemption by one. If each spouse filed as a single taxpayer, the tax regulations would recognize each as a head of household, which results in a larger standard deduction and a wider tax bracket. After marriage, the couple only receives one “head of household” designation and they incur a higher taxable income as a result. This higher taxable income creates the second reason for the couple’s marriage penalty. With a higher income, they can no longer take full advantage of the EITC and pay a higher tax as the result. Due to the compression of the tax brackets under the TCJA, couples with widely different incomes can see a tax reduction after marriage. The Tax Foundation provides the example of a $20,000-income earner marrying a $60,000-income earner. In this situation, the couple will end up paying about $31 less in taxes after marriage compared to their combined tax bill if they filed as single filers. For more information on recent tax changes for business, visit our post on New Business Tax Changes with TCJA. Note these changes affect the 2018 filing-year, not the taxes you file this year by April 18. If you need help with tax planning for the 2018 tax year, please contact us.